I have a new favorite molecule: adamantane. As you probably know, someone is said to be ‘adamant’ if they are unshakeable, immovable, inflexible, unwavering, uncompromising, resolute, resolved, determined, firm, rigid, or steadfast. But ‘adamant’ is also a legendary mineral, and the etymology is the same as that for ‘diamond’. It’s a somewhat strange shape. Puzzle 1. Give a clear, elegant description of this shape. Puzzle 2. What is its symmetry group? This is really two questions: I’m asking about the symmetry group of this shape as an abstract graph, but also the symmetry group of this graph as embedded in 3d Euclidean space, counting both rotations and reflections. Adamantane has an interesting history. The possibility of its existence was first suggested by a chemist named Decker at a conference in 1924. Decker called this molecule ‘decaterpene’, and registered surprise that nobody had made it yet. After some failed attempts, it was first synthesized by the Croatian-Swiss chemist Vladimir Prelog in 1941. He later won the Nobel prize for his work on stereochemistry. However, long before it was synthesized, adamantane was isolated from petroleum by the Czech chemists Landa, Machacek and Mzourek! They did it in 1932. They only managed to make a few milligrams of the stuff, but we now know that petroleum naturally contains between .0001% and 0.03% adamantane! but ironically, the crystals are rather soft. It’s all that hydrogen. It’s also amusing that adamantane has an odor: supposedly it smells like camphor! 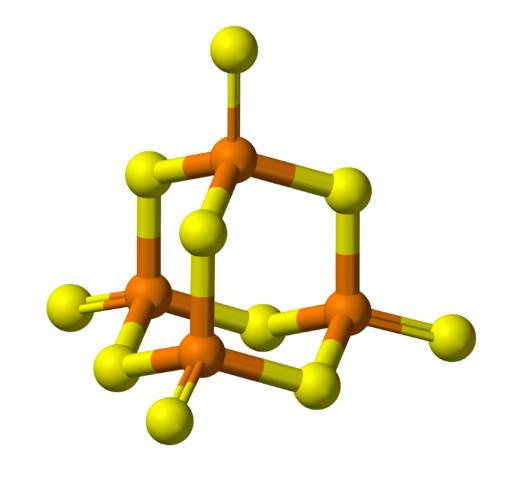 Adamantane is just the simplest of the molecules called diamondoids. 4 is called isotetramantane, and it comes in two mirror-image forms. Many different diamondoids occur naturally in petroleum. Though the carbon in diamonds is not biological in origin, the carbon in diamondoids found in petroleum is. This was shown by studying ratios of carbon isotopes. Eric Drexler has proposed using diamondoids for nanotechnology, but he’s talking about larger molecules than those shown here. • Diamonds and triamonds, Azimuth, 11 April 2016. This entry was posted on Tuesday, May 2nd, 2017 at 5:00 am and is filed under chemistry. You can follow any responses to this entry through the RSS 2.0 feed. You can leave a response, or trackback from your own site. Yes, they are interesting molecules. 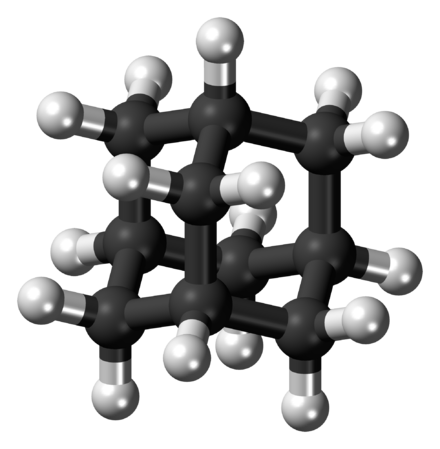 I think adamantane is basically a tetrahedron. The four atoms with three C-C bonds are the vertices, and the sides are just connections via a CH2 group. So geometrically, the symmetry group is that of a tetrahedron. And there are two kinds of C – vertex and mid-side. Although there isn’t that much difference between them – each has four unstrained tetrahedral bonds. And there is really only one kind of C-C bond, linking a vertex C and a mid-side C.
The alkane with just the four carbons linked – tetrahedrane – is interesting. Hasn’t been made yet – it seems too strained. But adding a CH2 in each bond takes out all the strain. Great! To complete answering my questions, the symmetry group of adamantane as an abstract graph is the same as its symmetry group as a geometrical object in Euclidean space: both are the symmetry group of the tetrahedron, namely the symmetric group S4, the group of permutations of 4 things. Out of curiosity, is there a simple physical explanation for why we should consider both rotations and reflections when computing the symmetry group of the molecule as a tetrahedron, in other words, why is it rather than ? For the chemist the point group symmetry of tetrahedrane is not not but . What is ? Another name for the same 24-element group? Hi, Noam! It’s going a bit far to say we “should” include reflections as well as rotations when discussing the symmetry of a molecule… I’d be content to say we “can”. But since you posed this challenge, I’ll try to argue that we should. The laws of quantum mechanics relevant to chemistry are symmetrical under the rotation/reflection group so if a molecule has some subgroup as its symmetry group, this group will have a representation on the Hilbert space describing the ‘vibrational modes’ of that molecule: that is, the ways it can vibrate. The energies of these vibrational modes, and the allowed transitions between vibrational modes, can be studied using the spectrum of the molecule: usually these transitions cause the absorption or emission of infrared light. So, we can learn interesting things about the infrared spectra of molecules using the representation theory of the group We could use the smaller group that excludes reflections, but then we’d learn less, since we’d be ignoring the effects of reflection symmetries. The group is called the point group of a molecule, and chemists have developed a flow chart to allow them to easily determine this group. Hans Bethe used characters of point group operations in his study of ligand field theory in 1929, and Eugene Wigner used group theory to explain the selection rules of atomic spectroscopy. The first character tables were compiled by László Tisza (1933), in connection to vibrational spectra. Robert Mulliken was the first to publish character tables in English (1933), and E. Bright Wilson used them in 1934 to predict the symmetry of vibrational normal modes. Bethe and Wigner are, of course, heroes of mathematical physics. By the way, most of the pictures here and in my blog article are from Wikipedia, and you can learn more by clicking on them. When present in a symmetric environment, enantiomers have identical chemical and physical properties except for their ability to rotate plane-polarized light (+/−) by equal amounts but in opposite directions (although the polarized light can be considered an asymmetric medium). Enantiomer members often have different chemical reactions with other enantiomer substances. Since many biological molecules are enantiomers, there is sometimes a marked difference in the effects of two enantiomers on biological organisms. I think the other question I was trying to formulate was, does chemistry distinguish a molecule from its mirror image? From the links I learned that sometimes it does, actually, and that there is a name for the two halves of such a mirror pair: “enantiomers“. You can see that it’s different from its mirror-image form. Most biological molecules have this property, too. You may have heard of the sugar called ‘glucose’. This comes in two mirror-image forms. On this planet life mainly uses the right-handed form, called ‘dextrose’. It’s ‘right-handed’ in the sense that the polarization of light passing through a solution of dextrose gets rotated clockwise. It’s always puzzled me how humans and other animals could be consistently asymmetric. A 50-50 mix of two mirror-image forms could easily be explained by “spontaneously broken symmetry”, but in fact there are many instances of populations with a uniform handedness. Many examples appear in Weyl’s book “Symmetry” (see “week63”). To take an example close to home, the human brain appears to be lateralized in a fairly consistent manner; for example, most people have the speech functions concentrated in the left hemisphere of their cerebrum – even most, though not all, left-handers. One might find this unsurprising: it just means that the asymmetry is encoded in the genes. But think about it: how are the genes supposed to tell the embryo to develop in an asymmetric way? How do they explain the difference between right and left? That’s what intrigues me. In the conference proceedings on biological asymmetry, there is an interesting article on the development of asymmetry in C. elegans. Ever since the 1960s, this little nematode has been a favorite among biologists because of its simplicity, and because of the advantages understanding one organism thoroughly rather than many organisms in a sketchy way. I’m sure most of you know about the fondness geneticists have for the fruit fly, but Caenorhabditis elegans is a far simpler critter: it only has 959 cells, all of which have been individually named and studied! There are over 1000 people studying it by now, there is a journal devoted to it – The Worm Breeder’s Gazette – and it has its own world-wide web server. Moreover, folks are busily sequencing not only the complete human genome but also all 100 million bases of the DNA of C. elegans. The question of exactly how the embryo’s asymmetry originates from some asymmetry at the molecular still seems shrouded in mystery. And there is another puzzle: how did the biomolecules choose their handedness in the first place? Here spontaneous symmetry breaking – an essentially random choice later amplified by selection – seems a natural hypothesis. But physicists should be interested to note that another alternative has been seriously proposed. Weak interactions violate parity and thus endow the laws of nature with an intrinsic handedness. This means there is a slight difference in energies between any biomolecule and its enantiomer, or mirror-image version. According to S. F. Mason’s article in the conference proceedings, this difference indeed favors the observed forms of amino acids and sugars – the left-handed or “L” amino acids and the right-handed or “D” sugars. But the difference is is incredibly puny – typically it amounts to 10-14 joules per mole! How could such a small difference matter? Well, Kondepudi and Nelson have done calculations suggesting that in certain situations where there is both autocatalysis of both L and D forms of these molecules, and also competition between them, random fluctuations can be averaged out, while small energy level differences can make a big difference. That would be rather satisfying to me: knowing that my heart is where it is for the same reason that neutrinos are left-handed. But in fact this theory is very controversial…. I mention it only because of its charm. Take a silicon wafer and expose the diamond structure surface to dopant surfactants such as arsenic and it will rearrange in all sorts of ways. Same thing happens with germanium. I was the first to observe this years ago in my early research work. Since that time, the semiconductor industry has used this idea for nanotechnology structuring of computing devices. Nick is quite right in all respects. Each face of the tetrahedron can be thought of as a hexane ring with 3 C atoms being shared with all 3 of its neighbouring hexane rings (Normally C6H12 but with 3 C-H bonds on each ring being replaced by C-C bonds with 3 other rings to form a four sided solid). And i think you mistakenly stated the number of H atoms as 30 when it can only possibly be 16 (6 CH2 + 4 CH). Badeisha’s graphic is interesting but confusing in that it includes a C from 4 separate additional diamond atoms in the overall lattice. (Diametrically opposing corners of the cube). The double hexagon shape it contains when viewed from (i suspect 4) different angles is very interesting to me as i am investigating the space-filling and structural forming properties of cuboctagons. When viewed from some angles these objects exactly describe both a cube, a planar hexagon and also a sphere, rather like the animation. The major difference between the diamondoid and the cuboctagon is that the cuboctagon’s periphery (consisting of 12 interconnected outer vertices/C atoms) is exactly equidistant from a central point (vertex) and that this distance is the same as that connecting all external points to it’s nearest neighbour. The cuboctagon can also be created from 8 symmetrically connected equilateral tetrahedra (or, simultaneously, 6 connected pentahedra). Fascinating stuff! You’re right, there are just 16 hydrogens in adamanantane. I’ll fix that now. I was not able to find the word “cuboctagon” anywhere on the internet. Did you mean “cuboctahedron”? Thanks John – i had a brain fade :-( Cuboctahedron is the term i meant! – not a 2D polygon but a 3D structure i think may lie at the root of all atomic structure, or could explain a lot about how atoms in nature tend to align and bond. For example, using it as a model it is very easy to see how all the electron orbitals up to the energy level of the 3d shell are oriented around a central nucleus. Can definitely see the similarities/shared symmetries with adamantine and the fundamental tetrahedronal shape of the 4 phosphorous atoms that is then expanded upon to form the entire molecule. Given that this molecule shares no atom types with that of adamantine its safe to say they share very few other properties, particularly chemical ones. 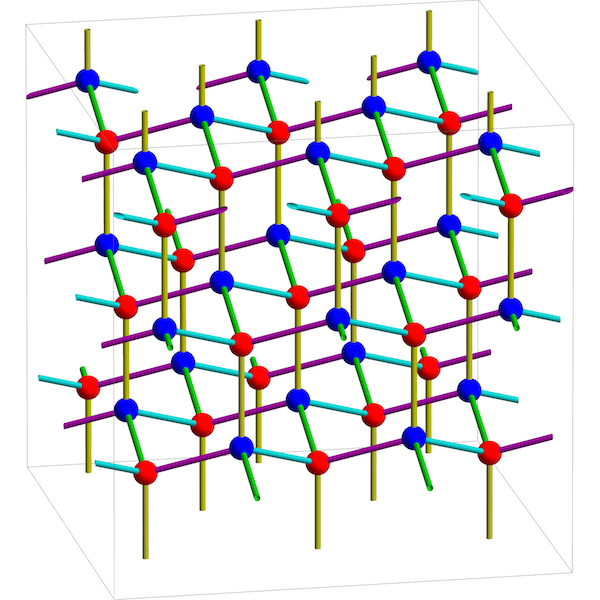 I see from Wikipedia that the crystallisation forms more into planes than a solid 3D like diamond and wonder why it seems to break its tetrahedron shape and form hexagonal ‘rings’ of 6 interlinked PO4 ion shapes. • D. Stachel, I. Svoboda and H. Fuess, Phosphorus pentoxide at 233 K, Acta Cryst. C51 (June 1995), 1049–1050. I am thinking that the structure of the diamondoids, with the symmetry, could be represented by the lower degree polynomial in three variables with the same symmetry of the diamondoid: so that with the right parameters could be possible to overlap the level surface with the structure of the diamondoids; so that there could be the symmetry, and the shape of the diamondoids in a single formula.